There is a baseball field behind the new house that we live in. It has a little playground, so over the weekend we decided to take Charlotte there so she could explore. The photos on the layout are from that little adventure. It was Charlotte's first time going down a slide and she was a bit skeptical of the whole thing. At first she seemed to enjoy it but then she seemed a bit scared only seconds later. I think she was much more comfortable going down the slide whilst in my lap. 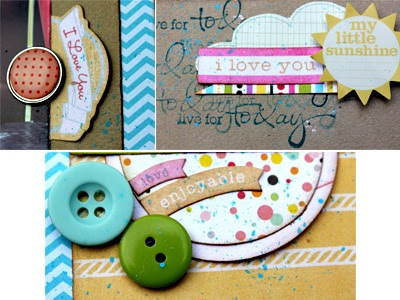 The blue chevron background and all of the border strips (aside from the pink gingham border which is from Authentique's "Delightful" collection) are from Bella Blvd's "Sunshine and Happiness" collection. I used my EK Success Binding Edge punch to add a little interest to the green polka dot border. The word 'sketchy' is spelled out using Bella Blvd's Blue High Five Alphabet stickers. The word 'Slide' is spelled out using Pebbles' "Kraft with Love" alphabet stickers. The kraft background it's self isn't truly kraft. I've been all out of kraft paper for a while so I had planned on stocking up at my LSS. They didn't have any! So I settled for a few pieces of the reversible "double dot" paper by Bo Bunny. I just picked up the closest color to kraft that I could find. I added the journaling right to the large photo. For the embellishments in the bottom corner I just punched out two circles from one of the Dear Lizzy Neapolitan papers. I added a few of the teeny tiny word banners from Authentique's "Delightful" collection. I threw in some buttons (October Afternoon's Sidewalk Chalk) for some added texture. The two tiny embellishments that are beside the middle picture are just a Dear Lizzy (Neapolitan) brad and another little sticker from that same Authentique's "Delightful" collection. I've really been wanting to stamp a little more on my projects so, in the upper corner, I decided to use one of my little sentiment stamps (from the Michael's dollar bin). It's a stamp that says "live for TODAY". I just stamped repeatedly in a small circle where I knew I would be placing my embellishments. I stamps two or three times without reinking just to give off different tones. I love the end results and hope to incorporate stamping more and more in my layouts. The "i love you" label sticker is from My Mind's Eye "Miss Caroline" collection. The cloud and sun are from Pink Paislee's "Prairie Hill" collection. I finished off each cluster of embellishments with a few tiny splatters of blue paint. Adorable layout!! Slides can be a bit scary ;) lol. Love it! I love the way the strips are laid out - great design! awesome layout!!! love all embellies! Love all the layered paper strips! This page is oh so cute! I love the larger photo of the two of you. LO loves slides too. Now he can go solo, including the climbing up portion. It's nice because I get to stand back and just watch him go back and forth 50 times, instead of me carrying him which is EXHAUSTING! LOL! Love all the pattern paper you chose. I bought some bella blvd collections, forgot the name, but they're for little boys. They look even better in person and can't wait to play with them. Awwww this is such a sweet layout. We have a park behind our house and my girls loved it when they were young. You really rocked this LO. I love your style! what a great layout!! and those photos are so precious!